Hi! Thanks for visiting my JUGGLING FOR JUDE donation page! Through this project, I raise funds to support St. Jude's lifesaving mission of finding cures and saving children. I started juggling my soccer ball for St. Jude in the summer of 2014, when I was 9 years old. $225,000 later, and my effort to collect donations is now year-round! YOU can help, either by donating or doing some jugging of your own and seeking donations via my Juggling for Jude Challenge. (find out more on my website at www.jugglingforjude.com). There you will find more information about how you can help JUGGLING FOR JUDE help kids with cancer! My juggling record as of now is 3,215 consecutive juggles (you can watch the video here: https://www.youtube.com/watch?v=NACmLtmRA8Y). I got that record on June 25, 2018, at the age of 13. I know the higher numbers mean more money for St. Jude, so I'm determined to keep going for records, even though that took me 34:22 to do! PS Please spread the word! 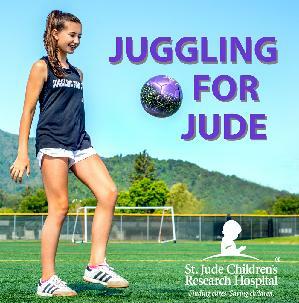 With more people knowing about Juggling for Jude, the sky's the limit for how much we can support St. Jude's amazing mission! Together we can help St. Jude change the world. Storm and Luca; Lemonade Stand #2!! Storm, Gio and Luca's Lemonade Stand!